Interior doors are rarely damaged. However it does happen, and if it does, few people know what to do. We will explore why you may need an interior door repair, and some tips on who can help with such problems. The worst case scenario is to have an interior door replacement. In such case, you would need a new door installation services. There are places where you can get standard doors. In the past, doors were all custom made. However, industrialization has made it easier for everyone. You can now get a standard door of any kind. Especially for residential use, there are standard sizes for interior doors and many designs you can choose from. When you are doing a door replacement, it is important to know the exact size of your current door. You can change the whole door with frame included, or keep the frame. If you chose to keep the structure, then the replacement door should be similar, if not the same. That way you will maintain the aesthetics of your home, and it will not seem just an improvisation. 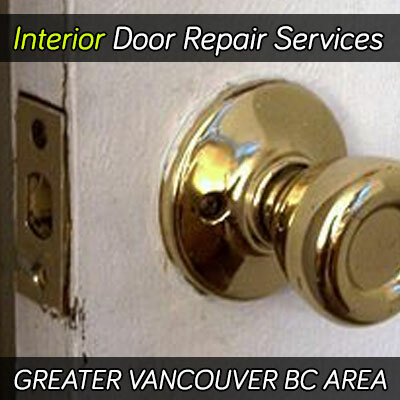 If you need an interior door repair, we are here to help if you live in the greater Vancouver BC (Our Coverage Page). We specialize in any sort of door repair, including frame, lock and the door jamb. Our professional staff can give you advice on which is the best solution to your interior door problem. When you look for contractors to improve your doors, ask for their experience before you hire them. It is best to hire a professional expert in doors, then just a carpenter or blacksmith. They are good at only one thing, but they are not aware of the many possibilities with doors. When a door remains closed because the lock broke, then damage by brute force to open it is common. Interior doors are open most times, but if they are not at your home, then they are susceptible to damage by brute force. Such damage usually will break the frame, since it is the weakest part of the system. In such cases, you would need an interior door frame repair. If the door is damaged, it depends on the extent of the damage. The solution can be just to patch and fill gaps. However, when the structure of the door is damaged, then a complete change is needed. When you are moving from one home to another, it is common to damage interior doors by an unexpected hit. It is also possible if you are moving furniture inside your home. Big furniture in small spaces requires extensive manipulation. Door frames are most times the places with the smallest space. In such conditions, an unexpected hit is almost sure. Keep your home with adequate furniture and handle things with extra care to prevent such unpleasant events. When people get angry, it is common that they kick things. Doors are susceptible to receive kicks from angry people. A single kick will not severely damage a wooden door. However, repetitive kicks will eventually dent the door, and they can break it if they are applied with excessive force. Weather rarely hurts interior doors. However, it is possible, especially if there is no air conditioning system or if the house is inhabited. In such cases, interior doors suffer almost as much as the exterior doors. The solution is the same than for exterior doors. If the damage is extensive, then the replacement of the door is necessary. The best solution for damage caused by weather conditions is prevention. Maintenance is easier than any emergency repair service. It implies painting mostly. A remedy can be as hard (and expensive) as a full replacement. It is better to avoid such situations by just preventing.